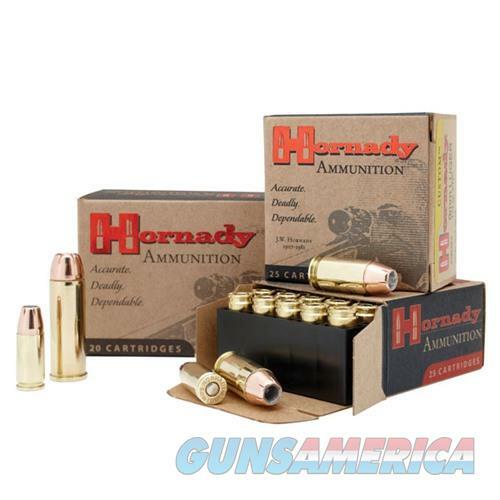 Description: Hornady 9136 CUSTOM AMMO 40 S&W 180GR JHP Hornady produces most of its own brass for their Custom line of handgun ammunition, and that brass is made or chosen for reliable feeding, corrosion resistance, proper hardness, and the ability to withstand maximum chamber pressures. Powders are matched with each load to ensure optimal pressure, velocity, volume, and lot to lot consistency. Primers are chosen to match each powder and load, and to quickly and reliably ignite the powder charge. With XTP?, FMJ, or the new FTX? (Flex Tip eXpanding) bullets, Hornady Custom handgun ammunition is hard-hitting, accurate and proven.